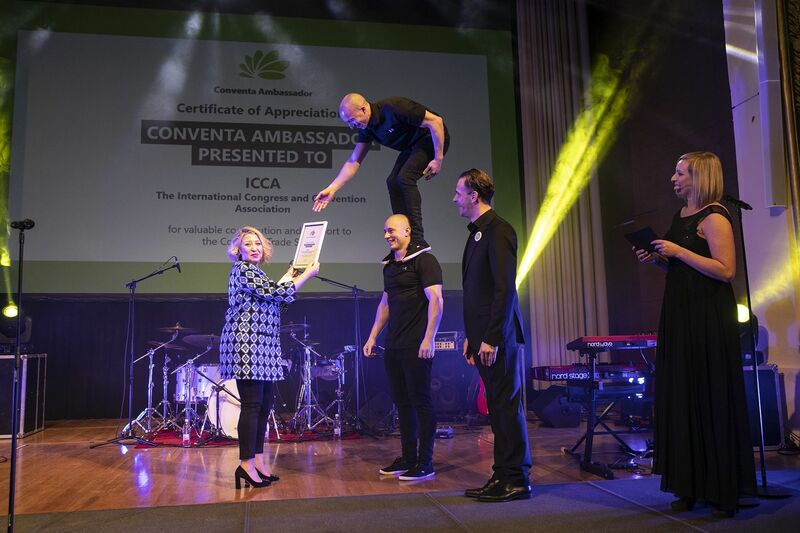 Elif Balci Fisunoglu, ICCA Regional Director Europe, accepts the Conventa Ambassador 2019 on behalf of ICCA in Ljubljana, Slovenia. As recognition for its contributions to and strong support of the development of the international association meetings industry in the New Europe region, as the Conventa trade show calls Southeast Europe, ICCA was named as Conventa Ambassador for 2019 at an official awards ceremony during the 11th edition of Conventa in Ljubljana on 23 January. Accepting the Conventa Ambassador Award on behalf of ICCA during the awards ceremony at the Grand Hotel Union, Elif Balci Fisunoglu, ICCA Regional Director Europe, said: “Conventa is an important vehicle for ICCA to help in shaping and guiding the future of international association meetings in Central and Southeast Europe, and as fellow advocates of the value of the association sector for destinations, we are proud to have established such as a strong working partnership with Conventa organisers as the years have gone by. By supporting them in their work, we aim to contribute to the development of the meetings industry in the region, grow ICCA membership and advance the professionalisation of the meetings industry as a whole. The award is dedicated to Rok Klancnik who, as the head of the Slovenian Tourist Board in Brussels, had been taking care of promotions since Conventa’s beginning. He set an example as the biggest ambassador of the Conventa trade show.